Designed by Dutch architects, these artificial tower constructs would essentially provide a safe haven for flora, fauna, sea creatures and winged animals alike. Such things become all the more useful in larger cities lacking in open space; places where metal and concrete have overtaken nature. So.. how exactly could adding another skyscraper make up for too many skyscrapers? Well, as the name seems to hint, these floating structures would be built for water, tethered to the ocean floor for various sea creatures to use. From there, they would bellow upward, gradually widening near the top. “The concept idea is that we took park zones in urban areas, we divided this in pieces and put them vertically on top of each other, at the end it became a vertical hangout for wild life.” they finished. What are your thoughts? Is this a good concept? Does it have any potential drawbacks you can think of right off? 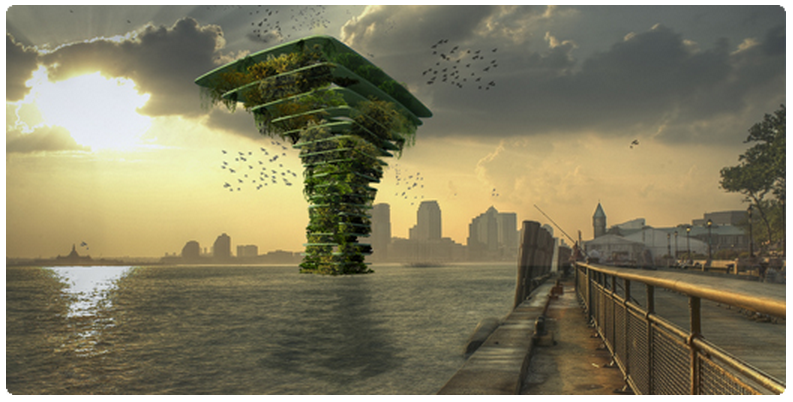 On a related note, learn about conceptual vertical floating farms here. How Likely is it That Earth Will Experience an Impact Event? Has Voyager Really Left Our Solar System?